Gardens serve to feed us, to shade us, to delight us. But weaving together a beautiful burst of color in your landscape requires thought and meticulous planning. You simply can’t plant every color flower in a bed and hope to win yard of the month. Carefully consider your hues, and your seasons—and Diandre Sunner, Lead Landscape Designer at Carolina Landscape, is here to help build your Pinterest-worthy plot. The first things you’ll want to consider before adding your colorful annuals are your staples: the trees, shrubs and perennials. (Foliage can bring its own arrays of colors, too!) For December through February, think Camellias, Rosemary and Red Buds, and then in the spring Azaleas, Saucer Magnolias, and bulbs (Daffodils, Snowdrops, Hyacinth). June through August is best for Roses, Hydrangea, Crape Myrtles, Agapanthus, Canna Lilies, and in the fall opt for Ornamental Grasses (Panicum, Sweet Grass), Salvia, Cassia and Japanese Maple. After the staples have been established, select your annuals, since those will be swapped out twice a year. “Around April we’ll start switching to the warm season annuals,” says Sunner, noting April through October is considered the warm season in Charleston. Warm, colorful plants to consider are Begonia, New Guinea Impatiens, Coleus, Angelonia and Pentas. 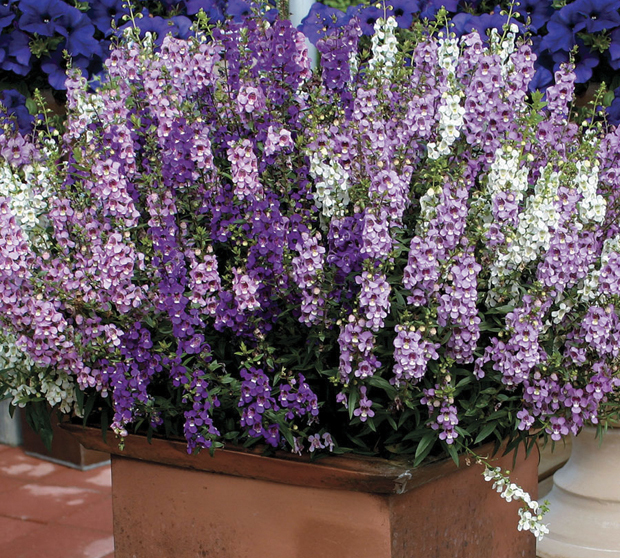 For the cool season (November through March), Sunner’s favorite annuals include Ornamental Kale, Foxglove, Cyclamen, Pansies and Snap Dragons. What hue of florae you choose next should then be based on the garden’s surrounding textures. “If you have a lot of brick, like we do downtown, try not to use too much red. It’s a bold color and will fade away or clash with its surroundings. “Certainly use red, but maybe as an accent instead,” Sunner advises. “Just like in your interior, you don’t want to clash colors; you want to complement them.” Reds and pinks are an ideal color if you have a more neutral-toned house, such as grey or white, and they will boldly pop against the background. For her designs, Sunner starts with cool colors: purples, pinks, blues and whites, which are calming tones to utilize in any garden. And don’t forget white, which is in fact a color. “There is amazing beauty in white and it provides elegance and simplicity. It pops against almost any other color and people should consider using it someplace in their gardens.” Most of the plants that Sunner recommends to use for color come in white. If you want to pull off a really colorful garden, it’s at this point that you should start playing with complimentary colors. Balance is definitely key here, and much of your design will depend on your style of garden and how much space you have. Complementary color pairs include blue and orange, yellow and purple, then pink and green.